You fascinate me endlessly. What kind of Pokemon are you? How do you do the things you do? You are so frankly bizarre that you have garnered both a meme and a reggae song that is not currently my ringtone or anything. You, sir, are popular. You are one of the Wonderful 151 and yet not as popular as Pikachu, who is just a stupid electric rat thing. You, however, are a mentally-retarded pink hippo creature. Your mouth opens wide like a convenience store. You are blissfully unaware of your surroundings at all times, and so inept that even Team Rocket can harvest your tails. And yet, Slowpoke, you are cuddly levels of adorable. Both of your evolutions involve something attaching to your body. Why? 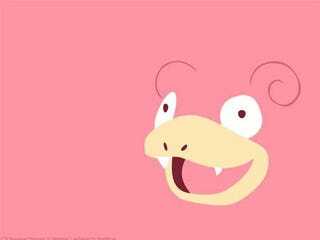 Slowpoke needs dat bling. But Slowpoke, I must let you know. I love you. Not in that way, though, that's weird bro. But not as weird as people who draw you on DeviantArt.